Class leading ballistics including velocity and energy load, as well as wound channel, weight retention and use case, this isn’t the top of the charts on every number against all competition, but across the entire class, this is easily a more capable round overall than the competitors. 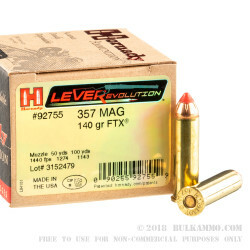 Hornady’s lever revolution round is designed specifically for lever guns, but it does not have to be kept in that stringent parameter, it is equally capable in defensive handgun uses or in semi auto configurations. 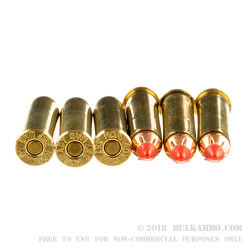 The incredible capability on target of this round makes it an obvious choice for those who want to push their .357 Magnum experience beyond normal. 1440 feet per second out of the muzzle and delivering 645 ft. lbs. 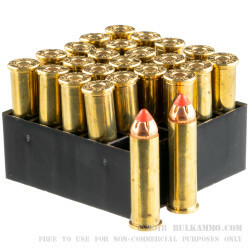 of energy in a 140 grain projectile for the already proven .357 Magnum, makes this round something special. It is a hunting dynamo for moderate and large game for lever guns and a clever addition to your ammunition stores for anything that needs the ultimate in penetration, stopping power or flat shooting trajectory. The super-fast, ultra-flat trajectory means you are on target every time and with numbers delivered in a 140 grain payload that cannot be duplicated easily. Outstanding performance. Superior terminal energy retention. 140 grain projectile is offers great knockdown with manageable recoil in the S&W light weight revolvers as well as lever action rifles. Well done Hornady.